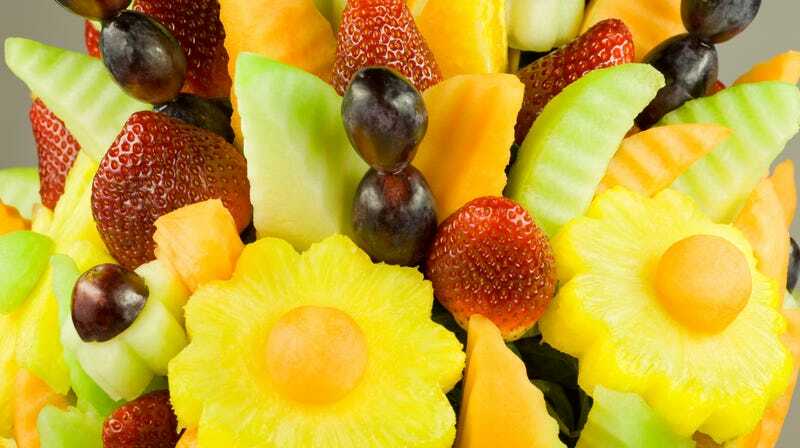 Edible Arrangements’ business plan is thus: Impale berries and melons onto skewers; assemble in a vaguely floral fashion; charge $75. As such, its “bouquets” are generally relegated to Mother’s Day, Administrative Professionals’ Day, or an especially festive Arbor Day bash. But Edible Arrangements’ new CEO is hoping to revive the slumping chain by convincing us it’s actually a great choice for smoothies and doughnuts any day of the year! Wait, what? Business Insider reports CEO Mike Rotondo, previously the head of Tropical Smoothie chain, has set a goal: to-go items such as smoothies, chocolate-covered berries, and fruit salads should make up a quarter of Edible Arrangements’ business. The big catch? No one knows that Edible Arrangements actually sells that stuff. “I can’t tell you how many people can’t tell you that we have that kind of a storefront presence,” he admits. With stores located mostly in strip malls and shopping centers, Edible Arrangements’ own CEO admits they’re not always top-of-mind when you’re in the mood for a snack. Plus, many of its locations are focused on the berry-basket side of things, not really equipped to morph into a smoothie shop. Earlier this year, the company sued Google for $209 million arguing that ads for competitors (like floral companies that also do food gift baskets) appearing at the top of search results for “Edible Arrangements” zapped sales. Surely the CEO hopes swipes at “wannabe” competitors and the smoothie-and-snacks initiative will turn around flagging sales, but to my mind, it will never solve the core trouble facing Edible Arrangements: Anyone can shove a strawberry on a stick.